The new installment focuses on Ricky Caldwell (Eric Freeman), the brother of Bobby Caldwell. He recounts to Dr. Bloom (James L. Newman) his memories of their parents being killed by a man in a Santa suit, their childhood in an orphanage run by bitter nuns and the Christmas Eve his brother lost it. This wraps into new memories about how his own life went wrong. He also comes up with a naughty list that leads to killing people close to him and others in the neighborhood. An unsuspecting guy taking out his trash gets shot as Ricky shouts, “Garbage Day!” Ricky gets busted, but he has one last person on his naughty list – the nun from the orphanage. Will she finally get her gift on this Christmas Eve? Silent Night, Deadly Night Part 2 surpasses the original in the sense that it contains the meat of the first film and adds on a thick layer of fresh blood pudding. Eric Freeman is allowed to play the roll with an over the top nature that allows a moment like “Garbage Day!” to grow over the decades. There’s also a killing with an umbrella that makes the film more than a rehash. This is as seasonally magical and gross as the original. Years after the original Silent Night, Deadly Night 1.4, Cinema Overdrive located the first three reels of Part 2 for a complete screening. At the time, the mystery of what happened to Eric Freeman was at full tilt. Eric was from Raleigh and rumor had him lurking in the city. So word was put out that if Freeman wanted to see the film, there was a free ticket at the box office for him. Sadly he didn’t show up. The original director’s commentary mentioned that they couldn’t locate him to be a part of the DVD chat. But now Freeman has surfaced and he’s embracing the majesty of Garbage Day. Thankfully with the release of Silent Night, Deadly Night Part 2, a Christmas wish has been answered. There’s also a deluxe version available with a Ricky Caldwell action figure for the perfect holiday gift. Audio Commentary with Director Lee Harry, and actors Eric Freeman And James Newman allows the trio to recount the scant days they had to crank out the footage to make the film work. Freeman talks about how he went low profile for a while and couldn’t be reached for the original release’s commentary track. Slay Bells Ring Again: The Story Of Silent Night, Deadly Night 2 (74:39) features interviews With Co-Writer/Director Lee Harry, Actors Eric Freeman, James Newman, Elizabeth Kaitan, Darrel Guilbeau, And Kenny McCabe, And Makeup Effects Artist Christopher Biggs. Lee Harry talks about how he won a Student Academy Award. He speaks of how he was hired by the producers to originally recut the film to pass it off as a sequel. He pushed had to get the new footage shot that would allow it to be both new and old. Garbage Days Are Here Again (19:30) is a look at the film’s locations. Eric Freeman takes the host back to the places that Ricky once roamed. We see the house from “Garbage Day!” There’s issues with the microphones which sometimes happens when recording on location. I Don’t Sleep (62:19) is an extended interview with Makeup Effects Artist Christopher Biggs. He’s able to cover his entire career. This is a fine understanding of what it takes to make it. Biggs worked at Roger Corman’s studio. Audio Commentary By Co-Writer/Director Lee Harry, Co-Writer Joseph H. Earle, and Actor James Newman. This is the first time track when Freeman was low profile. Finding Freeman Trailer (1:01) promotes an upcoming documentary about Eric Freeman going low profile. Theatrical Trailer (1:57) reminds us of the original nightmare and now Ricky wants revenge. They even have the Garbage Day moment. 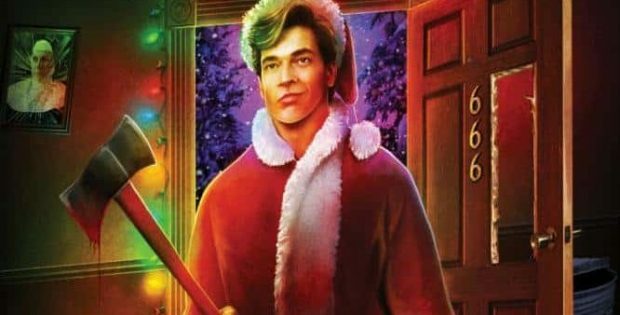 Scream Factory presents Silent Night, Deadly Night Part 2: Collector’s Edition. Directed by Lee Harry. Screenplay by: Lee Harry & Joseph H. Earle. Starring: Eric Freeman, Elizabeth Kaitan, James L. Newman & Jean Miller. Rated: R. Running Time: 88 minutes. Released: December 11, 2018.